Ashburton Grove - Arsenal news and Arsenal opinion: "Sometimes you cannot manage your feelings and you cannot make everyone happy"
"Sometimes you cannot manage your feelings and you cannot make everyone happy"
Mikel Arteta says he cannot apologise to Everton fans for his celebration after scoring a penalty against his former club in their FA Cup defeat at Arsenal. The Gunners vice captain slotted home after Alex Oxlade-Chamberlain was clipped by Gareth Barry in the 70th minute. Arteta had to retake his original spot kick after referee adjudged that Olivier Giroud had infringed the 18-yard line before the penalty was taken. It gave the home side a 2-1 advantage over the Spaniard's former club and two late Giroud goals killed off the tie and sent Arsene Wenger's side into the next round. 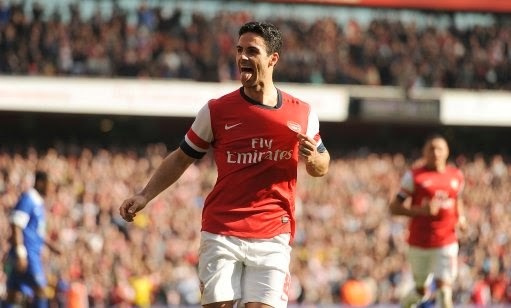 However some Toffees fans were unhappy Arteta celebrated the goal, having spent nearly seven years at the Merseyside club. But the midfielder said he could not say sorry for his actions. "It was my home for almost seven years and I have great memories from being there and am very grateful for the treatment I got, but now I am playing for Arsenal and have to do my best, and it will be needed there. "After I scored the penalty against Everton at home, some of the (Everton fans) were a bit upset with my reaction, but sometimes you cannot manage your feelings and you cannot make everyone happy. "I just try to behave myself the best way I can, and (do) what I think is fair."